Edward Carden (Ted) is a distinguised Anaesthologist - see Google for his many qualifications and publications. He is a member of the Rigsby, Lincolnshire branch of our family. He emigrated when young and now lives in Los Angeles. He is a flamboyant character who loves motor racing, big game hunting, and in November 2008 was in England shooting pheasants. 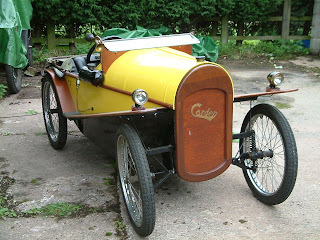 The illustration is a 1921 Carden Cyclecar which he has just purchased from a museum in Germany. He hopes to drive it on the road to exhibitions in California. A chapter in the book CARDEN OF TEMPLEMORE above gives details of the car and its designer Sir John Valentine Carden. I've just come across all your Carden/Carding stuff on the web - very interesting. There was always a legend in my family that we had (somewhat disreputable) roots in Ireland - and this seems to add weight to that theory.